Not to be confused with two-port network, which is sometimes called quadripole. A quadrupole or quadrapole is one of a sequence of configurations of things like electric charge or current, or gravitational mass that can exist in ideal form, but it is usually just part of a multipole expansion of a more complex structure reflecting various orders of complexity. ). The quadrupole moment tensor has thus 9 components, but because of the symmetry and zero-trace property, only 5 of these are independent. mutually perpendicular hyperplanes for the Kronecker delta to equal 1. As with any multipole moment, if a lower-order moment, monopole or dipole in this case, is non-zero, then the value of the quadrupole moment depends on the choice of the coordinate origin. For example, a dipole of two opposite-sign, same-strength point charges, which has no monopole moment, can have a nonzero quadrupole moment if the origin is shifted away from the center of the configuration exactly between the two charges; or the quadrupole moment can be reduced to zero with the origin at the center. In contrast, if the monopole and dipole moments vanish, but the quadrupole moment does not, e.g. four same-strength charges, arranged in a square, with alternating signs, then the quadrupole moment is coordinate independent. are components of the unit vector from the point of interest to the location of the quadrupole moment. Contour plot of the equipotential surfaces of an electric quadrupole field. , to a nonzero diagonal tensor of order three. Still higher multipoles, e.g. of order 2l, would be obtained by dipolar (quadrupolar, octopolar, ...) arrangements of point dipoles (quadrupoles, octopoles, ...), not point monopoles, of lower order, e.g. 2l-1. Coils producing a quadrupole field. All known magnetic sources give dipole fields. 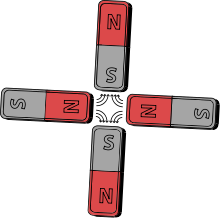 However, it is possible to make a magnetic quadrupole by placing four identical bar magnets perpendicular to each other such that the north pole of one is next to the south of the other. Such a configuration cancels the dipole moment and gives a quadrupole moment, and its field will decrease at large distances faster than that of a dipole. An example of a magnetic quadrupole, involving permanent magnets, is depicted on the right. Electromagnets of similar conceptual design (called quadrupole magnets) are commonly used to focus beams of charged particles in particle accelerators and beam transport lines, a method known as strong focusing. There are four steel pole tips, two opposing magnetic north poles and two opposing magnetic south poles. The steel is magnetized by a large electric current that flows in the coils of tubing wrapped around the poles. Also, the quadrupole-dipole intersect can be found by multiplying the spin of the unpaired nucleon by its parent atom. A changing magnetic quadrupole moment produces electromagnetic radiation. The mass quadrupole moment is also important in general relativity because, if it changes in time, it can produce gravitational radiation, similar to the electromagnetic radiation produced by oscillating electric or magnetic dipoles and higher multipoles. However, only quadrupole and higher moments can radiate gravitationally. The mass monopole represents the total mass-energy in a system, which is conserved—thus it gives off no radiation. Similarly, the mass dipole corresponds to the center of mass of a system and its first derivative represents momentum which is also a conserved quantity so the mass dipole also emits no radiation. The mass quadrupole, however, can change in time, and is the lowest-order contribution to gravitational radiation. are components of the (unit) position vector of one of the points. As they orbit, this x-vector will rotate, which means that it will have a nonzero first, and also the second time derivative (this is of course true regardless the choice of the coordinate system). Therefore the system will radiate gravitational waves. Energy lost in this way was first inferred in the changing period of the Hulse–Taylor binary pulsar, a pulsar in orbit with another neutron star of similar mass. Just as electric charge and current multipoles contribute to the electromagnetic field, mass and mass-current multipoles contribute to the gravitational field in general relativity, causing the so-called "gravitomagnetic" effects. Changing mass-current multipoles can also give off gravitational radiation. However, contributions from the current multipoles will typically be much smaller than that of the mass quadrupole. ^ Weisstein, Eric. "Electric Quadrupole Moment". Eric Weisstein's World of Physics. Wolfram Research. Retrieved May 8, 2012. ^ Jackson, John David (1975). Classical Electrodynamics. John Wiley & Sons. ISBN 0-471-43132-X. ^ Thorne, Kip S. (April 1980). "Multipole Expansions of Gravitational Radiation" (PDF). Reviews of Modern Physics. 52 (2): 299–339. Bibcode:1980RvMP...52..299T. doi:10.1103/RevModPhys.52.299.